In the cool, crisp minutes before Friday’s commencement at Grand Canyon University, Dr. Michael Berger joked that he’d seen a range of reactions to the suddenly stormy and briefly rainy skies. The locals were the ones bundled up under sweaters and jackets. Out-of-towners didn’t seem to feel the chill in the 60-something-degree air. Still, the rain was minimal, the puddles puny, and anyone unfamiliar with April in the Valley of the Sun had to marvel at how the crystal-clear weather blended with the ceremony message about new opportunities and wide-open futures for GCU’s 560 morning graduates. Their degrees were conferred in the Colangelo College of Business and the College of Doctoral Studies, and most completed their degrees entirely online. Berger, dean of GCU’s College of Doctoral Studies, is a concierge and guest-greeter each year at commencement, actively intercepting anyone he can to route them to tickets, entrances, restrooms or whatever they might need before he has to “step away and do the dean thing” with other University leaders at the ceremony. He is one of hundreds of GCU volunteers who make commencement a warm and inviting atmosphere for locals and visitors alike. Spotting the College of Doctoral Studies regalia in the crowd, Berger introduced himself to learners whom he might have known only from a name on a dissertation in some cases. He tried to shake hands with everyone. “You call them ‘Dr. so-and-so’ and they’re still a little stunned,” he joked. GCU President/CEO Brian Mueller urged business grads to pursue their dreams since “we need entrepreneurs who can build great companies and hire people” to grow their local economies. CCOB Dean Dr. Randy Gibb encouraged learners to find where their purpose lies in the business world and to live out the servant leadership principles imparted by the University. 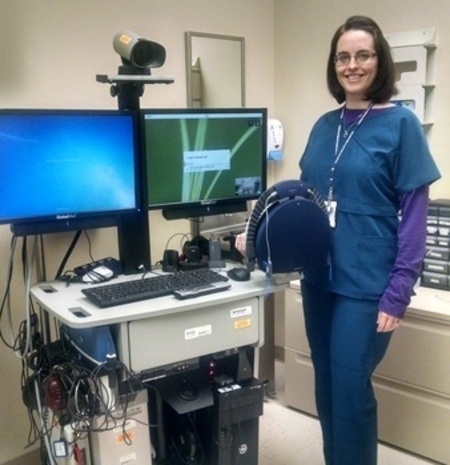 After earning her bachelor’s degree from GCU in 2012, Rose Burpo went back online for another. This spring, the Minnesota mother of four completed her master’s degree in industrial and organizational psychology, building on the undergraduate psych degree she earned while preparing four children for college. Burpo, 42, joked that she’d likely be back for another graduate degree soon, now that the kids, who range from 15 to 22, are flying the coop. 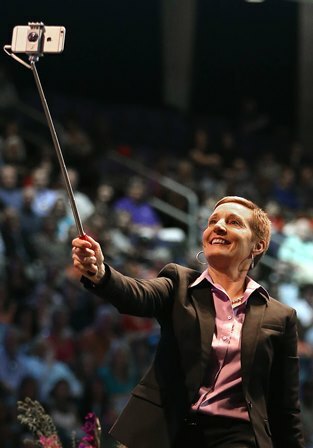 After being stuck in the wintry weather of northern Minnesota (there’s still snow on the ground), Burpo said it was a welcome respite to attend commencement Friday at GCU. She’s honored to be graduating the same month her eldest son graduates from college and eldest daughter graduates from high school. Burpo lives in rural Walker, Minn., and works at a U.S. Department of Veterans Affairs office in nearby Bemidji. After working at an assisted living center for seniors, she felt drawn to help veterans and began to push toward that goal by doing most of her schoolwork after a 3-11 p.m. shift at the office. She joined the VA a few months ago and now works as a “telehealth” technician, organizing monitoring equipment that connects vets to health care professionals so they can avoid driving to the doctor in some cases. In her region, many veterans are more than a two-hour drive to the nearest VA hospital in Fargo, N.D. She said she loves her job. Burpo foresees her master’s helping her make an impact at the VA. After raising four kids, she hopes to raise the hopes of others in her community. “To be able to go back to school online was the only way I could do it, both geographically and because of my schedule with my kids,” Burpo said. It took Michael Seabrook 38 years to get his bachelor’s degree because life — children, jobs, relocations … you know, life — happened. But Seabrook did it, and then some. The 61-year-old Maricopa resident, who joined GCU as an enrollment counselor in 2008, made good use of the University’s generous education benefit by first earning a bachelor’s in applied management. Three weeks after Seabrook began the program, his father died, and three weeks after that, his mother died. But he knew God had a plan for his life, so he pressed on. Seabrook tackled the coursework for a master’s in public administration with an emphasis in health care systems and earned a second degree. On Friday he accepted, with honors, a master’s in health care informatics from the College of Nursing and Health Care Professions. Having first started college in the 1970s, Seabrook had to embrace the learning curve of hitting the books again and become proficient with 21st-century learning tools. He admitted going through his share of “trials and tribulations” but said his wife, Cheryl, his children, Michael, Rachael and Heather, and six grandchildren all made it doable and worth it. He also enjoyed getting to know people during his collaborative learning assignments. Before moving 10 years ago from New York to Arizona, Seabrook worked as an accounts receivable district manager and then joined the mortgage industry, briefly, before the bottom of that industry plummeted. He said he never has been more fulfilled than in his job at GCU. Seabrook has been at every spring commencement since he became an employee. He graduated at three, volunteered at two and just came to watch the fun at three others. “It’s like a family,” he said of his GCU ties. Doula Zaharopoulos, GCU’s first doctoral graduate in business administration, can think for herself. For example, she doesn’t like Facebook and doesn’t even have a Facebook account. But that didn’t stop her from doing her dissertation on social media. Another example of her personal convictions is her attitude about teaching. Unlike many doctoral learners, Zaharopoulos is not looking to parlay her degree into a promotion at Phoenix College, the flagship campus of the Maricopa County Community College District. 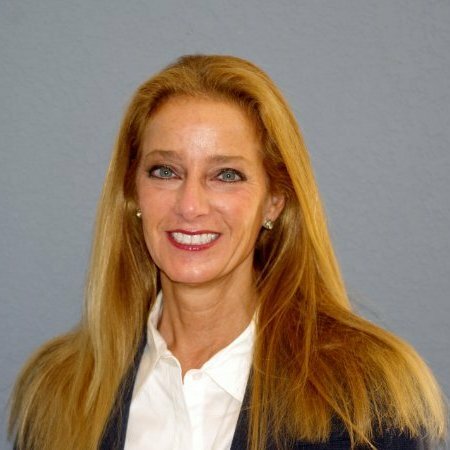 She’s a tenured faculty member and teaches business law, and she also was an online adjunct for GCU while doing her dissertation. Her enthusiasm is fueled by her students. Zaharopoulos has been teaching here for 18 years since moving from Milwaukee, where she grew up and got her bachelor’s and master’s degrees in business administration from the University of Wisconsin-Milwaukee. Her parents, Nicholaos and Kalliope, were born in Greece, and Doula speaks fluent Greek and has a “working proficiency” in Italian and Spanish. 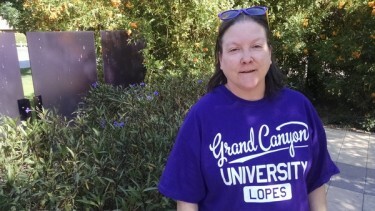 She didn’t know about the new GCU doctoral program in business administration until hearing about it while working out at a fitness center across the street from the Pointe Hilton Squaw Peak Resort, where the University conducts its doctoral residencies. “I really, really wanted a Ph.D. for the last 30 years, and when I called the counselor said, ‘Oh my gosh, we just started a DBA,’” she said. 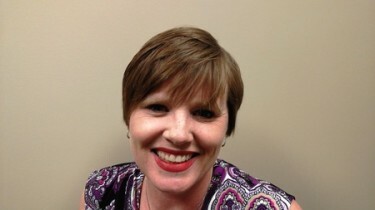 And even though she has her degree, she still plans to continue her research into how law firms use Twitter. Who does that? Doula does. Bill Stipp’s resumé is impressive. His 27-year career in the fire service included posts from firefighter to fire chief in Arizona, Massachusetts and Illinois. He has a bachelor’s degree in fire service administration and graduated from the executive fire leadership program at the U.S. Fire Administration’s National Fire Academy. Stipp, 51, is serving his second term on the Goodyear City Council, to which he was elected in 2011, and this week he received his diploma for a master’s in public administration from GCU’s Colangelo College of Business. Yet Stipp is proudest of his family: wife Lisa, and children Erin, 22, and Greg, 17. That’s especially true this week because, about 24 hours before his graduation today, Erin crossed the same stage in GCU Arena to receive her bachelor’s degree in communications from the College of Humanities and Social Sciences. From her birth, 13 weeks early and weighing just 2 pounds, 3 ounces, Erin has been special to her parents. Stipp didn’t know then whether college would be in the cards for his little girl. Erin chose GCU because of its Christian foundation and its smaller campus size, and she has the kind of relationship with her dad that makes a co-graduation all he better. Several family members, including Stipp’s 92-year-old mother, Marge, planned to be there, too. Stipp will have Kleenex just in case. 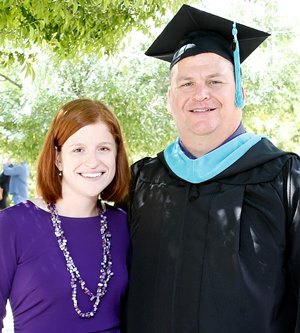 Friday, she got a doctor of education degree in organizational leadership, and she already is an online faculty member at GCU, teaching “Introduction to Graduate Studies” and “Progression of Leadership Theory” out of the Tempe office. What if you had told her back in 2006 that this day would come? “I would have said, ‘You’re crazy. All I want to be is an elementary school teacher.’ But then the doors just opened. I think it’s a God thing,” she said. Going through those doors wasn’t any easier, however. While continuing to work those brutal overnight hours, she earned her bachelor’s degree from Northern Arizona University and became a first-grade teacher in the Casa Grande Elementary School District. She continued on with NAU to get a master’s and was promoted to academic coach, but she didn’t stop there. Now she wanted a doctorate, too, and she settled on GCU because of its online program. Then she was hired by the University in January and discovered other benefits. “It’s such a focus on the employee and the employee’s family,” she said. “I never worked at a place where they wanted to include the family so much. And the Christian environment, too – I think that makes a huge difference. We had Chapel this morning. Where else can you go where they make that part of your job? Davis, 41, admits there’s another reason she wanted the doctoral degree. When she graduated from NAU, she saw that the doctoral learners wear a hat that’s different from the mortarboards of other graduates. “I wanted the hat,” she said, laughing. She certainly has worn enough different hats to earn it. With her master’s degree in hand, Mary Wanker can follow her passion to help at-risk children. 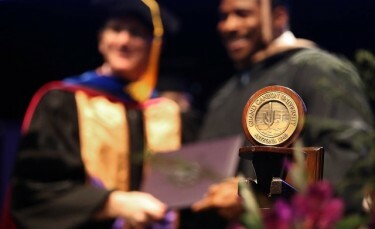 The 50-year-old resident of Clinton, Miss., earned a graduate degree in professional counseling online from GCU with the hope of acquiring the skills needed to be licensed in Mississippi. She’ll still need to work some post-graduate hours before she can apply, but there’s a light at the end of the academic tunnel. Wanker said her degree program was easy to follow and a lot less stressful than she expected. With such a need for counselors in her home state, she added that she’ll likely have professional options once she’s ready, and she plans to take her time to make the best career move. Before completing a master’s degree, Wanker used her bachelor’s in psychology as best she could, doing some counseling case management, substitute teaching and special-education assistance. She wanted to do clinical counseling on a full-time basis. “I’ve gone to school for a lot of years and I’m ready to work,” Wanker said. She said she might like to work with teens in distress, possibly through a crisis-intervention role or through a substance-abuse recovery program — anything where she’s in a position to teach children the tactics to “calm down and relax and cut through the stress” of their lives.